Under tall old pine trees in my meadow, one of my three goats stands tall with her front paws up in the air and her neck as straight as the old pine stems, then drops her head toward his sibling’s head. “Clash!” She is Pepper. The unfortunate little one, Twig, cries out and runs behind older brother Harvey. But soon, Pepper and Twig, like nothing has happened a moment ago, graze peacefully, rubbing their necks against each other’s. In them, I see familiar hints of the playfulness of my childhood, soaked in mud, playing hard, throwing mud balls at my younger brother, then suddenly with no sign of tiredness, sharing charcoal roasted chestnuts and laughing. Approaching the younger goats, if I move too quickly or in an unusual pattern, they startle and take off…to kind of nowhere but somewhere they think safe, monitoring my intention. When I move slowly, at their usual peaceful pace, they mirror me and follow along. My peace is their peace. But not all of my three goats are the same. The oldest one, Harvey, is different. Unlike his siblings, he has a very calm demeanor. You can know he is the leader of the pack and in charge of the family. His eyes reflect things as the morning pond water would. With such clarity, they reflect my thinking. He knows from hundreds feet away if I bring alfalfa treats for him. Often, he tells me just to do that. In his sky-like stillness, there is an irresistible charm of stealth. He does not beg for treats, but he makes me offer. With him, I can’t hide my intention. He looks through my heart. I don’t pretend what I am not that day. 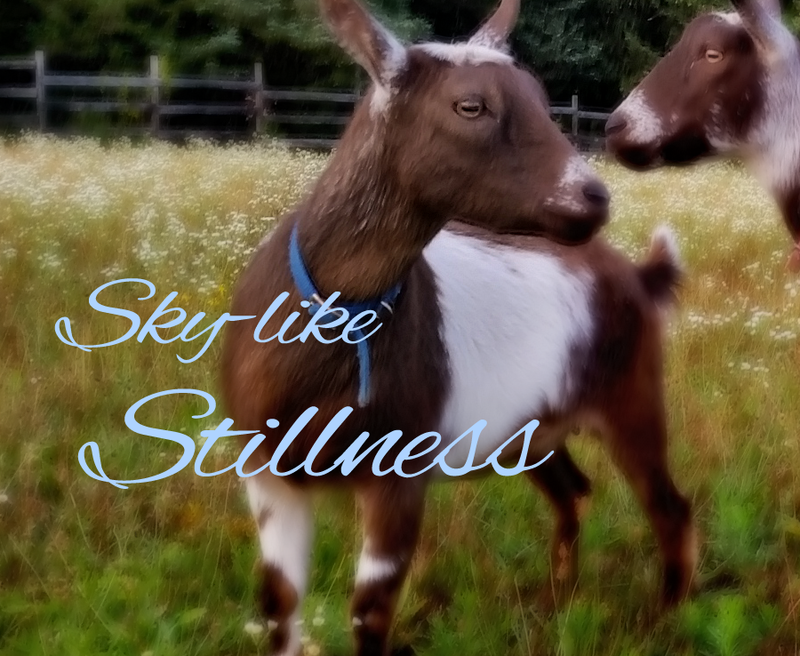 Sitting with goats quiets the mind. There are gentle waves that wrap the bustling energy and defuse it all. After a while sitting next to the goats, I become calm, and that’s when they come closer, surround me and lick my hands, then chew my shirt, and then stick their noses into my pocket, looking for the acorns I collected in the meadow. Then, their unmoving and unblinking eyes quietly send out signals that I hardly succeed in deciphering. But I now know how to feel them with my heart. Even the falling leaves of the blazing autumn pause for a moment to feel the silent waves. So does my afternoon pass in the meadow in the blink of an eye, doing this talk with no talk. My thoughts, finding nowhere to interrupt, semi-paralyzed, no longer have the force to tie me down. I fly freely, deeply into the blue bottom of these creatures’ eyes, in search of nothing. This entry was posted in animal, Mindfulness, nature and tagged autumn, calmness, childhood, depth, goats, memory, mindfulness, peace, relationship, sky-like, stillness. Bookmark the permalink.